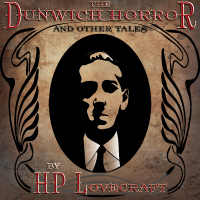 Now popular through role-playing games, card games, comic books, and an entire horror subgenre named The Cthulhu Mythos, Lovecraft's The Call of Cthulhu ranks among the greatest horror short stories ever written. Pieced together through several different "sources", Lovecraft magnificently paints a portrait of unease which grows upon the subconscious. Records surface of a Cthulhu Cult, who worship a diety with a "cuttlefish head, dragon body, scaly wings, and heiroglyphed pedestal". Such primitive cults have always existed in the world, of course. But what if there really were such a monster as that described slumbering in the depths of the ocean? What would happen if this sleeping Krakon was roused, and began to wreak an other worldly havoc? This audiobook is presented unabridged, and is 1 hour and 22 minutes long. Once your order goes through, you will receive an email with a link to the audiobook. This link is good for 72 hours. The audiobook is released as 3 mp3 files@128kbps. If you ever need more time with this or any order, just reply to the email containing the link. We are happy to give you more time. From Mark Eanes of Franklin, Indiana on 8/13/2015 . From sarah voorhees of Franklin, Indiana on 11/11/2014 . Good story and well read. Enjoyed this very much. From Saturday Sportsman of Phoenix, Arizona on 9/29/2014 . Great recording. BJ Harrison is hands down the best narrator out there. From John Mello of Woonsocket, Rhode Island on 2/11/2014 . 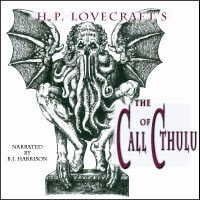 Mr. Harrison does an outstanding job of capturing the horror in this Lovecraft classic. 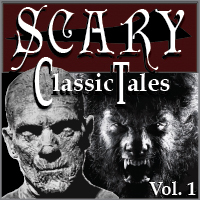 Listening to this audiobook with the lights ON is recommended as it can be very frightening in the dark. From Emanuel Nazareth of Toronto, Ontario on 11/15/2013 . As always a great narration. I'm looking forward to more H.P. Lovecraft.